Gary Shelford took over from Lizzie Wort in 2006 and played until July 2011. Hamburg in 2007 and Dubai in 2010. Using nothing but a wooden box, some amazingly creative sound effects and effective lighting, George Orwell's barnyard classic is told with clarity, power and truth. Shelford tells the story through the characters, switching from animal to animal, each possessing a different voice and unique characterisation. The audience follows this narrative. The simplicity and magic of Orwell's fairytale and his allegorical message of betrayed idealism is thus conveyed with blinding relevant, proving the work to be as important today as it was 50 years ago. Animal Farm is perhaps the 20th Century's most important work of political satire. It has been translated into over 70 languages and is on academic syllabuses all over the world. Guy Masterson's unique one-man adaptation and theatrical interpretation succeeded in bringing the book physically to life and making it accessible to all ages in a dramatic, animated storytelling that won worldwide acclaim. "IF YOU thought Animal Farm was an outdated allegory on the Russian revolution, get ready to wake up. In Guy Masterson's adaptation of George Orwell's great fable, Tony Blair and Margaret Thatcher are as likely to spring to mind as Joseph Stalin. That's not to say the record of modern politicians can be put on a par with the bloody purges of Stalinist Russia. This play's magic is to show how all politicians start off with good intentions and are slowly corrupted by power. "Everyone knows Animal Farm. It seems an odd choice, then, to reinvent such a celebrated novel as a one-man stage show, as Guy Masterson has done. The extraordinary Gary Shelford, chameleon-like, condenses the diverse voices of a sprawling farmyard menagerie into a captivating solo performance. It helps that Shelford has something of the everyman about him. His malleable facial features are put through their paces as he writhes around the stage, contorting himself into various shapes and postures with admirable elasticity. He renders the key players with real confidence, but copes equally well with the lesser figures - the hens, the sheep, even a lethargic tabby whose lazy yawns find amused recognition from cat lovers in the audience. At almost two hours, Shelford somehow manages to unflaggingly maintain a high tempo throughout. George Orwell's critical attack on Stalinist Communism, Animal Farm, has been adapted for the stage by Guy Masterson, neatly showing that it is not just that particular ideology that bears closer examination but current regimes. Directed by Tony Boncza, Gary Shelford takes on the huge task of telling the story, playing all of the characters along the way. Shelford does a sterling job of it, creating individual identities for all of the farmyard animals, both vocally and physically. With a stage that is bare, except for a box to stand on, a lot is asked of a performer, and Shelford delivers with a captivating performance. Lighting and, in particular, sound effects play a most important role in this work, assisting Shelford in his creation of mental pictures of the farm under the pig's regime. We could see the animals and the farm clearly, a tribute to an excellent script superbly interpreted. Don't let the somewhat zany photo on the ads for this production fool you - this is pretty much a straight up narration of Orwell's work, with Shelford occasionally dropping into character: an effeminate Squealer hides a fantastically nasty streak, Snowball is portrayed with a wide-eyed and innocent enthusiasm, and Napoleon was utterly terrifying during his moments of rage, with Shelford appearing to loom large on stage to accommodate the boar's enormous presence. Boxer, in particular, was so well developed that his death (oh no! a spoiler!) brought a tear to my eye. In general, Shelford brings the farm to life with nowt onstage but a small box; it's a great performance, full of enthusiasm and wit - the sheep provide beautiful - if ironic - comic relief. There's also the odd aside to give the text a contemporary feel - snippets of speeches by Tony Blair accompany the announcements of Napoleon, and there's a witty flourish with some of the attack dogs being called "Howard" and "Costello". Yes, it's contrived, and yes, it's cheap, but it's also a throwaway departure which doesn't detract overall. In fact, there's little negative to report from this show, with the exception of the air-conditioning which occasionally drip-drip-dripped onto the wooden floors and a rather annoying aural distraction. But that aside, this performance of Guy Masterson's adaptation of Orwell's corruption tome it's just bloody good theatre. Amanda wrote: Brilliantly executed, exciting and potent. Gary Shelford is a master of storyteller. Dannielle wrote: I was surprised when I saw this was a one man show with no props ( as I did not know in advance) but it could not have been done any other way! Gary Shelford was absolutely amazing and any fan of George Orwell's book is doing themselves a great disservice missing this educational, entertaining and unbelievably talent-filled performance! Minnie wrote: I was completely caught up in the story from the first moment. Gary Shelford is brilliant. By far the best actor I have seen not only in the Fringe but in a long time. Congratulations on bringing this show over! 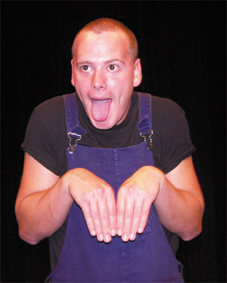 Emcee wrote: Having been impressed early in the Fringe by Guy Masterson's performance of Fern Hill and other Dylan Thomas' works, I had to see his adaptation of Animal Farm. Gary Shelford performs this time: a single performer on a bare stage. But what a performance! Through voice, gesture and actions, Gary plays a dozen animals and narrates as well. The audience is transported to the animal rebellion on Manor Farm. It's hard work for Gary but brilliant theatre for the audience. Dave Evans wrote: Must see. Vibrant and alive. Shelford deserves an award for the energy levels alone. Brilliant acting and stand alone performance. I was taken to Animal Farm and lived a part of it for 2 hours. Thank you and well done. Paul wrote: Full of energy - steeped in historical context, this really is the hidden gem of the Fringe. Shelford is full of energy and acting ability. He is a consummate storyteller, and delivers the adaptation with flair. Do not miss! Tamara wrote: Great adaptation. Commands attention. Very entertaining! Me wrote: Fantastic! Everyone should see this show. Stripeycat wrote: Outstanding. Moving. Awe-inspiring. Captivating from beginning to end. Gary Shelford is incredible. I don't know where he gets all that energy from. Must be seen to be believed! Helen wrote: Gary was absolutely brilliant - the energy he brought to the stage was staggering. His ability to bring this classic story to life as a solo performer was unbelievable. Moving, enthralling, I would recommend this performance to everyone to remind us of what power and greed can do to us all. Kate wrote: An entertaining and thought provoking modernisation of a great classic. Perfectly executed in a spellbinding manner. truly fabulous show. Carly wrote: This was absolutely awesome i loved every minute of it. was completely in awe of the wonderful transformation from man to pig at the end. Dee wrote: UNBELIEVABLE! I was dubious about seeing a one man adaptation of a book, but I shouldn't have doubted Gary Shelford's ability given the fantastic reviews he has received and so rightly deserves. Shelford brought the many characters to life so well, switching flawlessly and convincingly from pig to horse to donkey, and from accent to accent, that I was absolutely captivated for the whole 2 hours! I never want to read a book again. Fantastic performance of a great adaptation. BRILLIANT! See it! Becdah wrote: This guy is just amazing! The characters he brings to life without the use of props make you wonder if you are hypnotised... from sheep to Clydesdale in an instant. Great story and even better performance. Gary Shelford deserves all the praise he has been awarded both this Fringe and last. Sal A Manmilton wrote: Gary Shelford is the thinking man's Kelly Holmes: a thrusting and merciful relief. His performance was a beacon of pale gold in a festival of burnished steel. All I can say is: I saw this. What a ride. Talent with no apparent limits. Follow him and kill anyone who gets in your way to get that ticket. Hmmm wrote: OMG!! Another fantastic show at Holden Street. Gary Shelford is spell binding. An incredibly accomplished actor who captures an astonishing array of characters with no gimics, just technique and heart. Go and see it! Tim wrote: Brilliant adaptation of a classic and poignant story. Perfect delivery, very entertaining. I was transfixed from beginning to end. Everyone should see this show! Ozmoose wrote: I am in awe of this man (Gary Shelford). How somebody can flawlessly remember and recite dialogue for close to two hours is beyond me. Wasn't sure if a 1 man show with virtually no props and minimal effects could hold my attention but this was amazing. Surely one of the best value acts of the Fringe. Denise wrote: I went after seeing Guy Masterson do Fern Hill. Again, amazing! What a feat! Nearly two hours. A gruelling story brilliantly told. (Thankfully there is an interval!) Super storytelling and the adaptation was concise and clever. I loved the modern additions. And Squealer is a hoot... and very like our spinning politicians. The young people in the audience loved it as much as the adults. This is REALLY GOOD theatre. Amy wrote: One man doing Animal Farm - who'd a thought it?! Absolutely riveting - the time flies and there is no confusion over which character is being portrayed. Clever adaptation, brilliantly executed - highly recommended! Kristin wrote: I suspect the audience's near-silence last night wasn't because we weren't engaging. Quite the opposite. We were riveted. This was amazing. Thank you. Howardhater wrote: Brilliant! Hated the book. Now love it. Studied it at school. Nearly killed it. Now understand it. Wonderful performer. Great adaptation. FAB SOUND EFFECTS!!! (the sheep are hysterical!) The kids texting and playing around in the front row from that stupid school should be set upon by Napoleon! I wish I had the chance to see this when I needed to. Some shows good. This show better! Jackie Kitschke wrote: This one man show was great. His portrayal of all of the characters was such that after their first introduction there was no confusion over who was who. Any school student studying this book should go and see the play for a great interpretation of Orwell's work with a contemporary twist. I loved his Tony Blair Snowball!! Georgie wrote: Amazing! I went because it had Guy Masterson's name on (he did an fantastic Under Milk Wood last year) and was very impressed! Gary Shelford is a terrific performer. Nearly two hours of storytelling. And a great way to do Orwell's brilliant book. Highly recommended.